Mall of Asia isn't my favorite mall, but it holds dear to my heart for it was where my love for dining out sparked. Most of my first food reviews came from the vicinity, however, much to my dismay, I have never really blogged all the restaurants there. It was what I had wished for even before I started out with this blog. 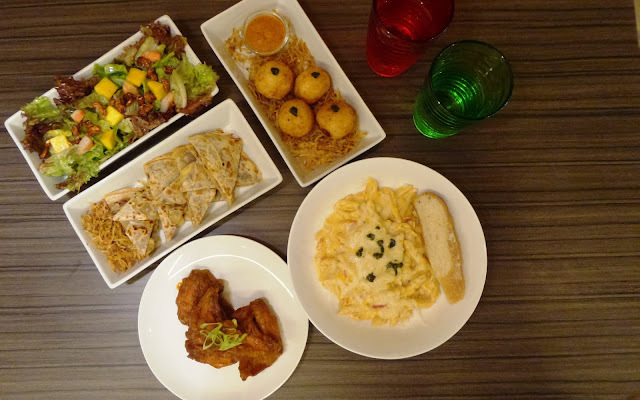 My husband and I share the interest in trying out new restos and coffee shops and now that my kids have grown and yep, grown in love as well to the same hobby - EATING, we couldn't help but be enslaved to the fact that restaurant hopping is above all fun and exciting. BUT! Well, there is always that "but", "however", "although", and many others, even with doing the one you love. We aren't that rich enough to go to each and every food establishments here in MOA or at any foodie venues and spend everyday trying out different dishes, it costs you know! So, finding out a restaurant that not only throws spotlight on good food and is inexpensive, we give enough glorification. Hail Uprice! Uprice is a play on the word "uprise" which means to rise up, get up or to come into existence or prominence. 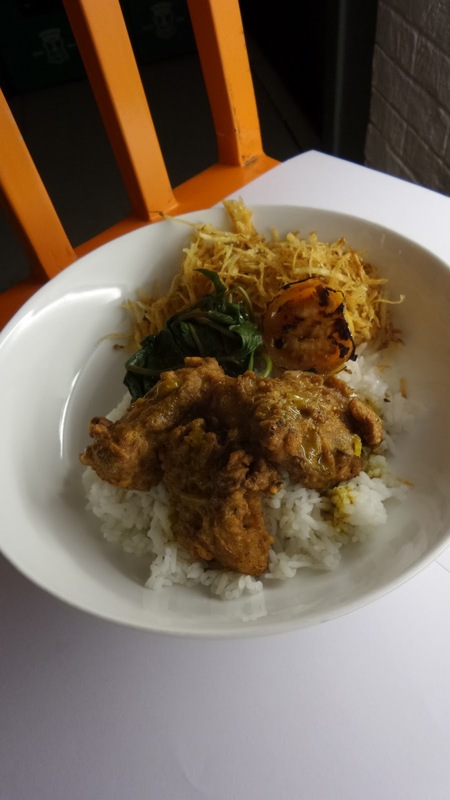 The owners had this idea of reinventing rice dishes or introduce rice into a different level. They are, btw, all food-lovers, chefs and even food-educators who hailed from De La Salle Beniled. Might I say they know their turf! When I said they have reinvented some dishes, what I meant was they put some changes to ordinary dishes without it becoming a fusion. When the rice balls where served to our table, it eventually piqued my interest on their menu more. What I though was an ordinary watering hole for a BPO serviced building, where Uprice is situated, was a gem of a dining place. I usually judge a resto by how it's delicately designed. I'm more keen on places decorated finely with gorgeous pendant lights, nice chairs and table, the whole resto vibe, that is. 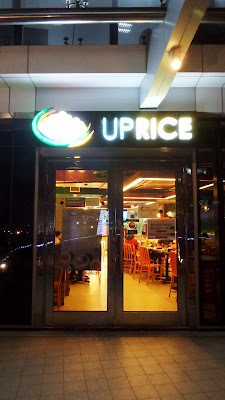 Uprice is more of a relaxed feel, not so much ado on it's interior except the multi-colored glasses they use to serve water. After seeing their menu and these Risotto Balls (P 150), I knew it would be a great dinner with my daughter together with fellow foodies. 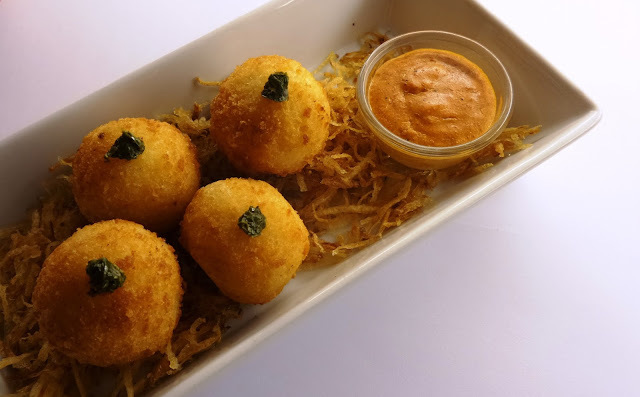 After having one bite, I thought I was savoring seasoned shredded potatoes meshed up with cheese and flour, not only after hearing it was a Risotto Ball that I realized that there were indeed rice in it. It comes with an Aligue dip (crab fat) which enhances the balls. 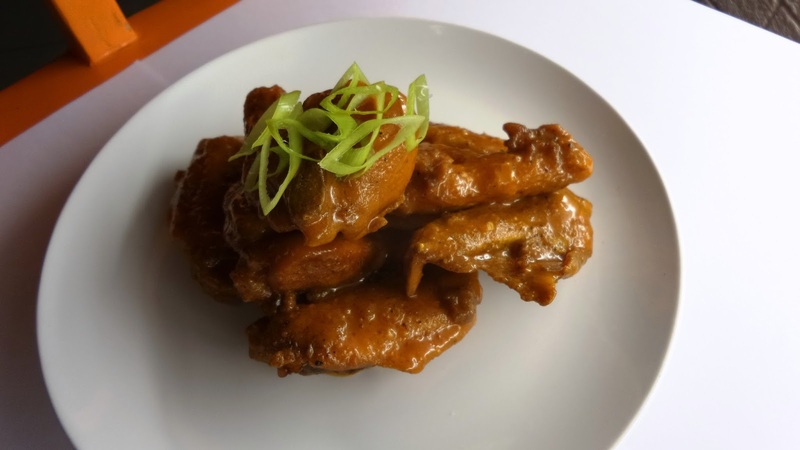 Another appetizer slash bar chow which is always being ordered is a plate of buffalo wings more known here as Angry Wings (P 150). Aptly called as it is, you'd actually feel it's anger in your palate as each bite fires up your taste buds, it was too spicy for me though. If you are brave enough to face it's anger, carry on, however, you can try to ask also to lessen up the spice a bit or drown it with beers and other beverages. 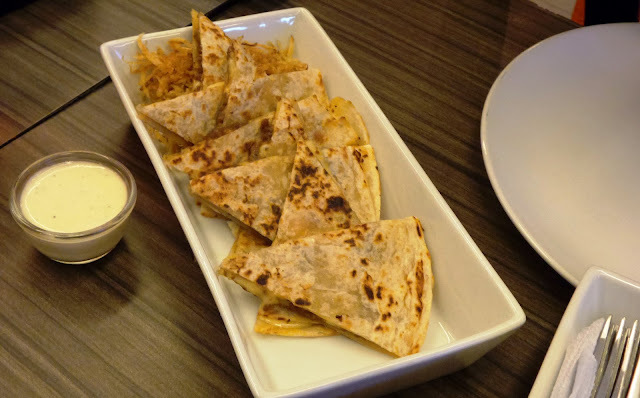 My daughter's favorite are these Spicy Beef Quesadilla (P 165). These though aren't that spicy as compared to the Angry Wings. It's spiciness straddled more into the curry-kind of spice however and when dipped in the aioili tends to be lessened. Another positive nod for them was knowing that everything that comes out of their kitchen is made fresh and made right in their kitchen, this includes the flat bread. Another Bar Chow that seems to bring in more customers is this Tokwa't Baboy, though it might not be the show-stopper, it definitely is a no-fuss grub. Hankering for something unique but truly comforting? 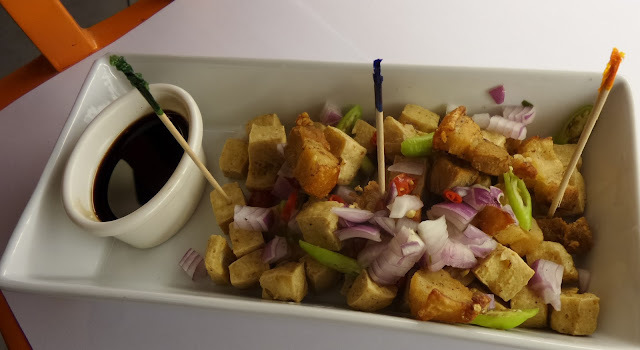 A plate of Tokwa't Keso can definitely open up your senses for out of the box take on fried tofu. 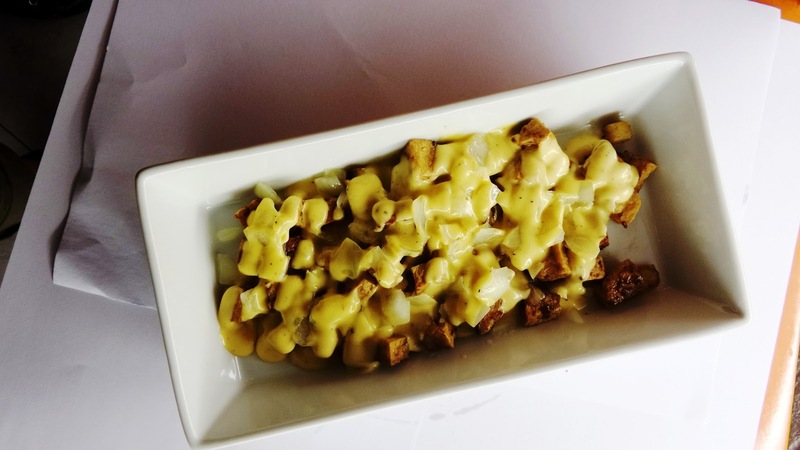 Surprisingly, I found the melted cheddar cheese to blend in with the tofu well enough. 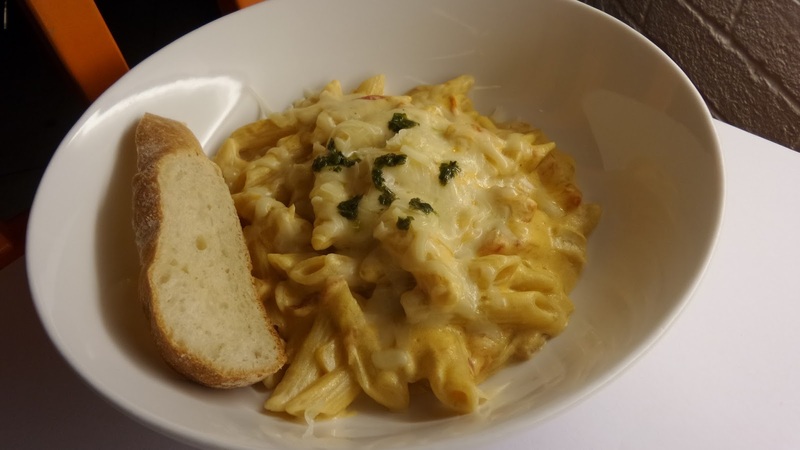 Creamy Margerita would be something to defy my kids from having carbonara, well it's still a white-sauced penne but more cheesy and creamy. Uprice prides themselves with everything done from scratch, making sure that what they serve passed through rigorous kitchen testing and in which their passion in cooking and baking just shine through. The Home-made Corned Beef and Home-made Bacon are just classic examples. Chunks of beef briskets were enliven with a delicious cured flavor. A plate of order comes really hefty with a cup of plain rice, topped with sunny side egg, grilled tomato and fried finely chopped potatoes which they call Uprice potatoes. 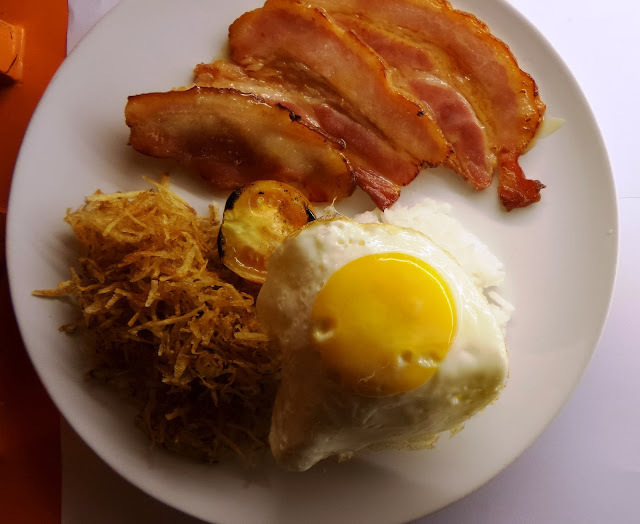 After having tried their Home-made Bacon, I remembered this humble restaurant in Kapitolyo that serves one of my favorite kind of bacon - slabs of bacon that is. It taste somewhat the same except Uprice' were sliced thinner, but definitely thicker than ordinary bacons. I like how it's saltier rather than having a sweet taste. 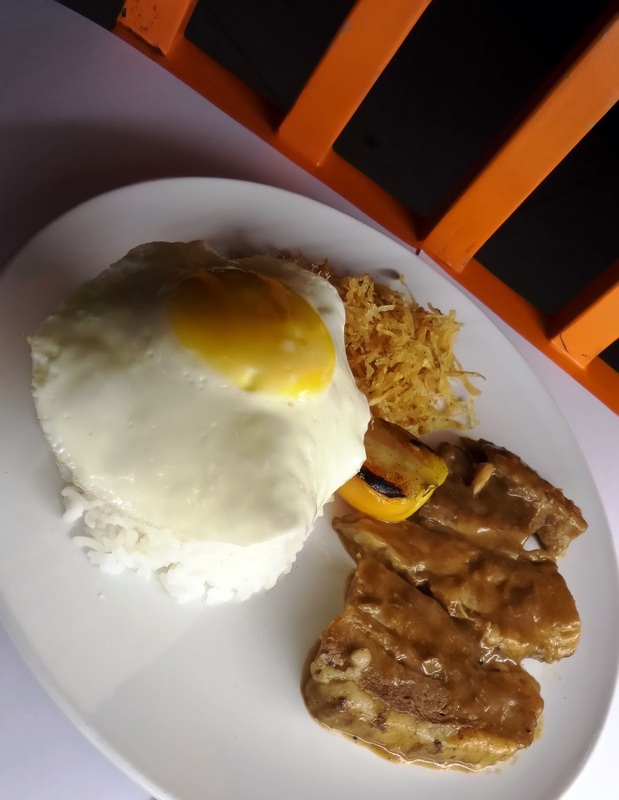 It's also served with sunny side egg topped plain rice and their uber yummy shoestring potatoes. Adding to the long list of my fave here is the Corned Beef Salpicao. My leverage for a good Salpicao is by how garlicky the whole dish is. 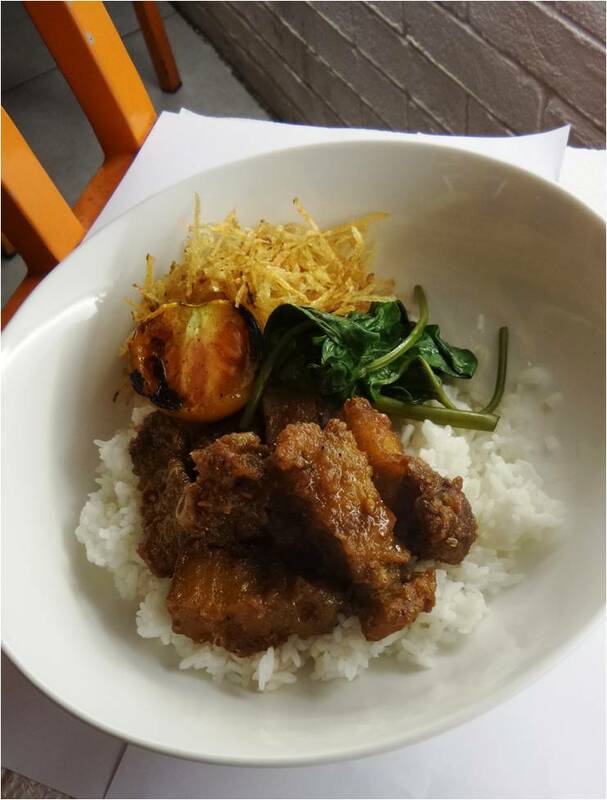 No, I'm not afraid of "aswangs," not even vampires (because I haven't really met one), it's just how a salpicao ought to be, bursting with garlic flavor, and Uprice' version just nailed it with added flare. The garlic sauce was made creamy and it's white. Aside for the regular trimmings, a mound of blanched kamote tops that was seasoned with sesame oil were added. The Asian Fried Chicken was something to look forward to. Crisp fried chicken crowned the top of a plain rice and a pungent less spicy curry sauce completed the ensemble. If you think Pork Binagoongan is boring, well, leave your woes outside Uprice doors as they did a good facelift to the dish. They used "ginamos" a different kind of bagoong where small fish were brined. Though deep-fried, the pork remained tender inside and the saltiness isn't overpowering as well. 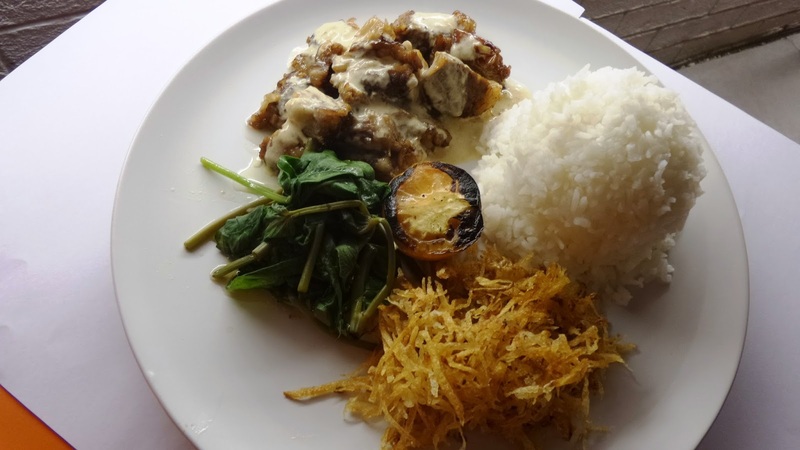 I just love how well-rounded their rice meals are, above all they added fun to the plates with Uprice potatoes, their home-made version of shoe-sting potatoes without too much sodium and without preservatives. With the kamote tops and the fries, plus a whole lot more inventive takes, this makes this place truly a hidden gem in Pasay. Wait then, till you see the desserts. 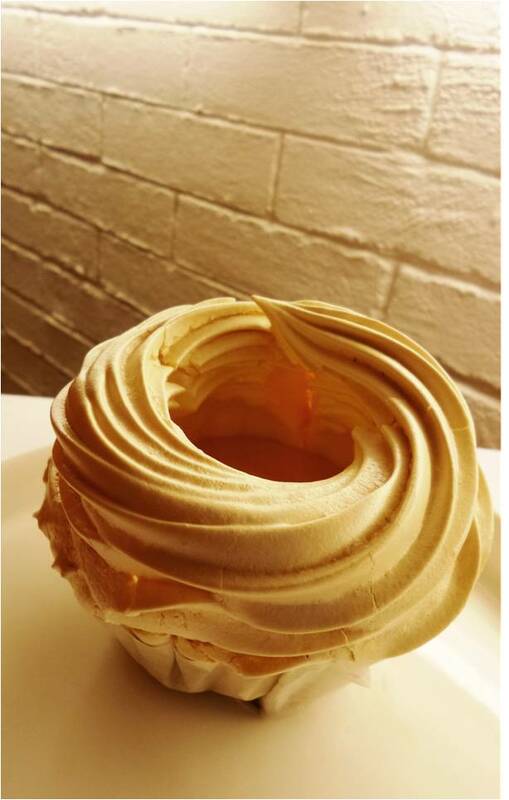 With a pastry chef on the roster of owners, expect dessert to be delightful as well. How about a caramely brownie ala mode? 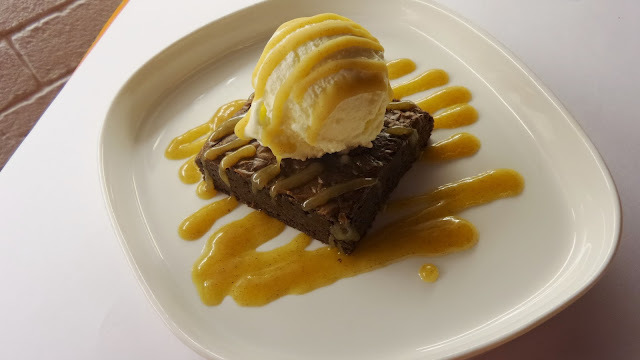 Though brownie is so common to me, I didn't really give so much attention to it, the caramel sauce was ok too. The foodies I ate with were raving about these two- Coconut Blondie and Crazo. 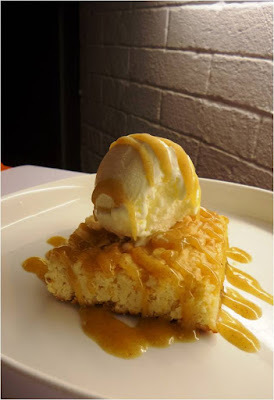 Coconut blondie was like a macaroon in a square form, topped with vanilla ice cream and a good drizzling of caramel sauce made this a good replacement to brownie ala mode. If you are crazy about dessert like me, this will make your meal crazier but amusing. Meet Crazo, a brazo (de mercedez) in a cupcake form. I love the play of sweetness, tartness and the textures. Encased inside the meringue is a lemony flavores custard that's sticky yet thin in consistency. It truly ended a night of devouring meat, rice and loads of food info from fellow foodies. Located at the veranda of Prism Plaza also known as Two Ecomm Center at the Mall of Asia grounds, it's a great venue to relax from the busy urban life and while your time away under the stars overlooking baywalk or gazing at fireworks during the weekends while listening to acoustic music. We've been there already a couple of times with the whole family and we always ended up going to Uprice.